When I picked up a leaflet advertising Charlie and Lola’s Extremely New Play I just knew we’d have to get tickets. Splodge loves Charlie and Lola (or LolaCharlie as he calls them), and he loves going to the theatre; throw in a ride on the tram to get there and you’ve got yourself the makings of a successful toddler outing. We’ve thought about taking him to see a pantomime, but at just 3 I think he’s a bit too young to fully appreciate a panto; plus panto tickets are usually extortionate, but at £10-£15 a ticket a trip to Charlie and Lola is financially more do-able. The theatre is slap bang in the middle of Sale, surrounded by great family friendly restaurants, so we’ll be going for a family bite to eat too. 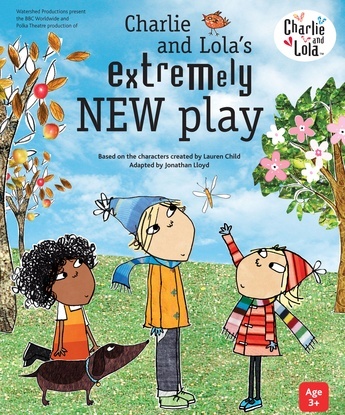 From 12 December 2013 to 4 January 2014 Charlie and Lola’s Extremely New Play based on Lauren Child’s books will be at the Waterside Arts Centre, Sale. Charlie and Lola’s Extremely New Play uses specially made puppets. Charlie and Lola appear as cut-out cartoon characters in the same magical world they inhabit in the books and TV series. From pink milk to party rings, everything you expect from the books and to series are there. During the show we’ll go on a magical journey through the seasons, as Charlie and Lola discover that everything is different and not the same. What happens when Lola and her best friend Lotta say they will honestly and promisedly look after Sizzles? And what happens when they follow Charlie and his best friend Marv on a Pirate Squidbones adventure? Playful, funny and full of surprises, reviews for the show have been excellent and I can’t wait to see his face when he sees LolaCharlie! This entry was posted in Books, Theatre & Entertainment and tagged Charlie & Lola, Charlie and Lola’s Extremely New Play, panto, theatre. Bookmark the permalink.